With a long day at work or school, how can someone possibly construct a gourmet meal for their family? It’s a lot simpler than you think. The No. 1 tip is planning. Just think how easy and convenient it would be to come home and have all your veggies chopped and ingredients pre-measured for a meal you planned to cook that evening. Sounds great to me. Therefore, having one day out of the week to do all the prepping and measuring for weekly meals, saves time and reduces stress. While planning is great starting point, having a balanced meal is also important to support healthy and happy family members. 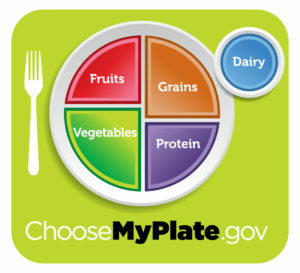 The United States Department of Agriculture (USDA) developed a great visual of what a balanced meal consists of called MyPlate. This graphic showcases balanced meal building blocks that include: fruits, vegetables, grains, proteins, and dairy. Using this visual you can ensure that recipes and meals provided for your family consists of half the plate being vegetables and fruit, while the other half is composed of protein and grains. Besides planning, prepping, and ensuring balanced meals, the main priority should always be family mealtime. Whether it be dinner, lunch, or breakfast, it’s important to make and eat family meals together. Or, if you are a student, away from family during mealtimes, it’s important to use meal time as a way to converse with roommates or friends. No distractions or electronics, just real conversions. 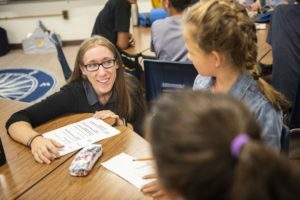 Dietetic Intern Rachel Bagne works with elementary students. 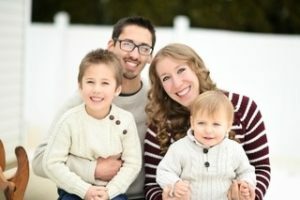 Want to learn more about family meal planning? Join NIU Dietetic Intern, Rachel Bagne, as she talks more about building a balanced menu for you and your family. Check out my conversation Rachel below. RB: I grew up in a household with a father who was dealing with a myriad of health problems, so I took on some of that pain and felt I could solve some of it through my own diet. Additionally, I’ve dealt with my own struggles around food, so I began to strive for more information through my education in order to, in a way, work on healing my own issues. On what area of nutrition do you want to focus? RB: I’m extremely interested in a preventative approach to working with those who suffer with disordered eating, as well as the pediatric population, and potentially the two in conjunction with one another. RB: I’m constantly asked for diet advice and meal plans in a “joking” manner. Neither of these are facets of dietetics that I am particularly interested in when I begin practicing, but I love that I’m seen as a trusted and knowledgeable source of information for people in my life. I went back to school as a mother and I love that a lot of what I have learned over the years has become applicable at home for both of my children. Want more tips on family meal planning? Come to the lunch talk hosted by Employee Assistance Program (EAP) 12 – 1 p.m., Wednesday, Oct. 24. Register for this event to learn the location on campus.